It appeared the Golden State Warriors were on their way to a blowout victory on Monday night at Oracle Arena to go up 2-0 on the Los Angeles Clippers in the first round of the NBA Playoffs. Golden State led 73-50 at halftime, and 94-63 with 7:31 to go in the third quarter. 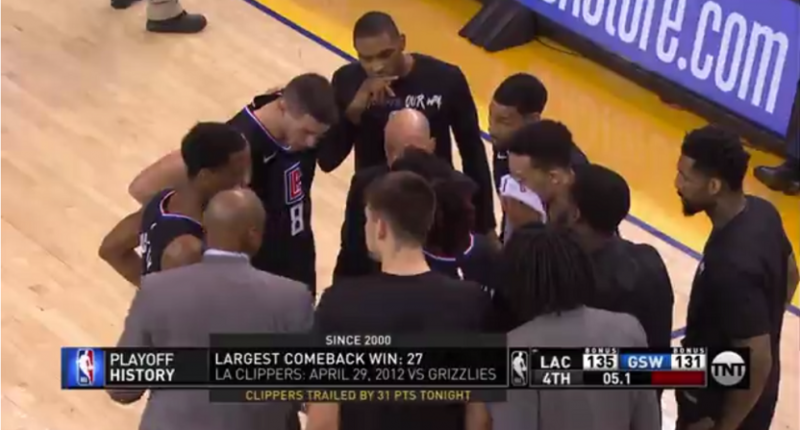 Incredibly, the Clippers battled back, on the road, against the defending champions (and heavy favorite for this year’s title) to erase a 31-point deficit and come away with a 135-131 victory. With the Clippers trailing 131-130, Landry Shamet nailed a go-ahead three with 15.9 seconds remaining to complete the comeback. Steph Curry had a chance to get the lead back for the Warriors on the ensuing possession, but missed a three and the Clippers pulled down the rebound. Lou Williams was remarkable for the Clippers, scoring 36 points off the bench on a variety of high-difficulty shots. The Warriors were certainly hurt by Kevin Durant fouling out in the final minutes, as well as DeMarcus Cousins leaving in the second quarter with a leg injury that is reportedly a torn quad. So, that could be a huge loss for the Warriors going forward. But that news (while it may ultimately end up being the bigger deal, of course) takes a backseat right now to the Game 2 loss. The Clippers deserve tons of credit for this comeback, but it’s also inexcusable for the Warriors to let it happen. And now the Clippers may be able to — surprisingly — turn this into a competitive series. The tied series now goes to Los Angeles, with Game 3 on Thursday night at Staples Center.